What a week. I got back to Park City on Monday, unpacked my bags, then repacked my bags and took off for Bend, OR on Friday. And I also squeezed in a full week of work and a few training sessions in between. But now I am in Bend, and ready for some skiing. We arrived here at about 2pm today and checked into our plush condo. We scored on lodging, getting a nice condo over looking the Deschutes River, a big park out back for frisbee and soccer, and pool, hot tub and sauna. All at a price that starving skiers can afford. We aren't used to living the high life like this and plan to take full advantage of it. This afternoon, Scott and I went for a mountain bike ride. The singletrack riding in Bend in incredible. Moab is still my favorite place to ride, but even Moab doesn't have singletrack to compare with Bend. It is all ridable and while you can cruise pretty fast, you better be on your toes or you will miss one of the many s-turns and find yourself off in the woods, as I did this afternoon. No harm done though. We rode for 2 and a half hours and barely scraped the surface of the trails in the area. My roommate, and ski team co-captain, from college lives in Bend and we are looking forward to having him give us a tour of the terrain later in the week. Of course, the main reason we are in Bend is to ski. Bend gets a ridiculous amount of snow during the winter and still has snow on the cross country trails in June. It is one of the best places in the world for off-season skiing. Because it is summer, you have to ski early in the morning. The snow freezes at night and begins to thaw out in mid morning. The time from 8-10am is when the snow is at its best - it has softened a bit so it isn't too icy, but it isn't mush yet. So we got up at 6:30 this morning, ate breakfast, waxed skis, and made the 20 minute drive up to the trails at the base of Mt. Bachelor. The skiing was incredible. The received a trace of new snow last night which took the hard edge off the icy tracks. I skated for two hours, very excited to be back on snow. I was a bit tired starting out, my muscles haven't been used this way very much in the past two months, but I felt better as I went. There is only about 12K of trails groomed, but I can't complain about the marvelous conditions. This afternoon, I decided to try a workout that Torbjorn has been recommending to us recently. He wants us to work on our anaerobic capacity. His theory is that since a good place to work on anaerobic training is in a place where you can't breath ( and therefore can't supply oxygen to the blood) we should try swimming underwater. After a short run, I went to the pool and did my laps. TBK wanted us to see how far we could make it underwater before we had to come up for air. Eventually, the goal is to swim 3 lengths (75m) underwater. I did the drill 4 times. On my best, I was able to make it 2 lengths. It was very hard. I was only under water for 15-20 seconds, but I was exhausted and gasping for breath after each one. Right now it seems impossible that I will be able to go three lengths, but I'll just have to see the progress I make in the next few weeks. I will also be interested to see how this affects my anaerobic capacity for sprinting, etc. It snowed an inch or two last night. This is a bit unexpected and would normally make the kick waxing very difficult. But since we only have about 4 klisters with us, it became surprisingly simple. I was amazed to findout that our limited supply was actually the perfect combination for today's snow. I skied for two hours and the only time the wax didn't work was for the last 15 minutes when the snow had turned to mush. I was surprised at how comfortable I felt on my classic skis. It was like I have been on them everyday. My technique was probably the best it has been all year. I'm not sure if that says something about how good it is now, or how bad it was this season. If you have seen me ski, I leave that call up to you. This afternoon my college teammate & roommate Colter Leys took us on a tour of some of Bend's finest mountain bike trails. I had planned on an easy hour-long ride to loosen up. Having trained with Colter for four years, I should have known better. Two and a half hours of pulse-pounding uphills and screaming downhills later, we had ridded some of the best singletrack I have ever been on. The only thing that the trails here lack is scenery and views. Other than that they are perfect. I felt pretty strong during the ride, but I was very tired afterward. Walking back up the two flights of stairs to our condo took all the energy I had left. 6:30 -8:00am Get up, eat breakfast, wax skis, drive to mountain. 8:00-11:00 am - Ski. Today's ski was an incredible crust skiing tour up towards Broken Top mountain. Pat Weaver led the way for us. Even more new snow made the going slower than usual and we had to cut the trip a little short. It was spectacular nonetheless. The first hour of the trip was all uphill, so steep in parts that you couldn't even herringbone. 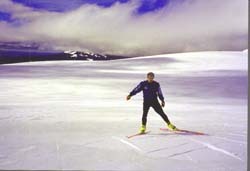 The cool thing about crust skiing is that you can go wherever you want. The crust is firm and the possibilities are endless. This becomes slightly less cool when your leader (Weaver) decides to take you straight up the mountain. When I was just about sure I couldn't go any higher we reached a ridge line between Broken Top and a neighboring peak. We skied down between the two, flying over the crust, jumping off bumps and shredding natural halfpipes. The main rule out here is don't fall. The crust is not very forgiving and it likes to take larger skin samples. Fortunately we made it back without any broken equipment and no lost blood, but plenty of close calls. 12:00-1:30 - Run errands in town (like getting these pictures developed). 1:30-3:00 - Update the website with new pictures and journal entries to keep you devoted fans entertained. Write emails to friends who have sent hate mail because I take forever to write back. 3:00-4:30 - Strength workout in gym. 5:00-6:00 - Ultimate frisbee game. 6:00 - 7:00 -Shower, eat dinner, and go to movie theater. 7:00-9:30 - See Star Wars for the third time. If you have yet to see this movie, drop whatever you are doing and head to the nearest theater immediately. 9:30-10:30 - Do dishes and get stuff ready to do it all again tomorrow. I have a million non-ski-related things I was going to get done at this camp, but I haven't accomplished any of it. Not that I am complaining. I realize that most people would call a day like this "vacation," and I agree. I am very lucky to be able to do leave work for a week to come do this stuff, all in the name of training. But I will need to slow down and relax a little before I head back to work next week. I have been training up a storm this week. I had planned on training twenty hours in the week that I am her e. But I am already at 15 hours and I have three days to go. I have already surpassed my highest weekly total for the year so far. With this in mind, I took it easy skiing today. First we did some technique filming so that we can analyze it later, then I went and skied for 1:30 classical. Nice and easy. My legs were very tight from the game of Ultimate yesterday and it took an hour or so to loosen up. It was much warmer today that it has been, which was a welcome change. There were a few brave (read: stupid) souls skiing without shirts on today. It was warm, but not that warm. I had hoped for a nice easy PM workout as well, but no such luck. Torbjorn wanted Erik and I to come along to a track workout he had set up for the skiers in his camp. The idea of the workout was to identify training levels. We did 5x400 meters. The first one at level one, the second at level two, etc., up to level five (as fast as humanly possible). Erik and I were basically supposed to set the pace. For the first couple, I was in the middle of the pack, as many people were letting their egos set the pace. However, by the last 400m I was ready to give it everything and finished in 59 seconds. Not bad considering how tired I felt. We finished off the workout with some plyometric exercises and a very hard triceps press "race." The RUN D.M.C. award for kickin' it old school - Scott Loomis, who did the whole race classical. The Stone Temple Pilots " grunge poser in borrowed flannel" award - Dave CHamberlain, who borrowed a flannel shirt 10 minutes before the race. The Madonna "Material Girl" award - Steve Banks for his fishnet outfit. The ZZ Top "Every girl's crazy 'bout a sharp dressed man" award - Jeff Banks and Tim Woodbury (who were also the race organizers). The Social Distortion "Prison Bound" award - the inmate. All entrants were disappointed that the "Bare Naked Ladies" award could not be given out this year. 1st - The UWGB team dressed in women's clothes - Worm and Skirt. They proudly accepted their golden Bachelor's Cup from the race organizers and then put it on for photos. Yes, I said they wore the Cup. Come to think of it, the kayakers were smart to leave early. . . This afternoon, Colter took Erik and I out to SMith Rock for a run. Smith ROck is probably the premier sport climbing location in the U.S. We were not climbing today, so we did an hour and a half run that wound around and over some of the most popular climbing routes. We saw probably 40 people climbing and COlter said that this was a very slow day. There was more than enough rock to accommodate them all though. It was an incredible run and it made me want to take up climbing. I'll add that to the "To Do" list. The trails were not groomed today. The master's camp ended yesterday and the upcoming junior camp does not start until Sunday. We were hoping they would groom Friday and Saturday anyway, but no such luck. We were early arriving to the trails today, and the snow was rock hard and rutted out from yesterday. We decided that our best bet would be to go crust skiing up towards Broken Top again. We followed essentially the same trail as the other day to get up to the plateau. Today there was no new snow and the going was a little faster. We did an extraordinary loop that took us up to the eastern ridge of Broken Top. We then followed this ridge up to the base of the crater. Broken Top, as you might have guessed from the name, is a dormant volcano. The top of the mountain has literally been blown off, creating numerous bowls, chutes, and steep slopes that we drooled over as we approached them. We skied as high up the mountain as we could without needing to take out skis off. From here, we pointed the skis downhill and let 'er rip. The snow was just starting to soften on top, making for beautiful cruising and tele-turns. We schussed and shouted our way down to the meadows below and then made our way back to the Nordic Center. It was probably the best crust skiing I have ever done. I was exhausted from three hours of skiing, but I still had the adrenaline flowing from the high speed downhills. The adrenaline from this morning was quickly zapped out of me on my mountain bike ride with Colter this afternoon. I told Colter to take it easy on me since I had trained 25 hours in the previous seven days and was starting to hit the wall. I'm not sure why I told him this, because that is the equivalent of letting a shark get a whiff of your blood. But he was gentle and we went out on an easy trail. It might have been too easy. I was looking around at the runners on a nearby trail and the mountains in the distance because we had not yet encounter anything other than a smooth, straight trail. I guess I was thinking that there was no reason to be focused solely on the trail just yet. Big mistake. I looked ahead of me just in time to see my front wheel narrowly miss a rock the size of a large television. But it was too late to avoid a collision with the rest of my bike. I slammed into the rock at full speed. I flew off the bike and down the embankment next to the trail. I wasn't hurt and I quickly scrambled back up the bank to check on my bike. It didn' escape as well as I did. It was scratched in a few places and the front chainring was bend out of true. It was still ridable, but the two largest front chainrings were useless. I needed to get it home without anymore damage. Colter and I did a short, easy loop and called it a day. Tonight we went over to Colter and Annie's house for a BBQ and a slideshow of their trip to South America last year. They were in South America from August 15-February 15 and toured Peru, Bolivia, Chile, and Argentina. They travelled mostly on bike and did backpacking trips at certain points along hte way. The slideshow was incredible. Amazing photos of amazing places, with an excellent narration of the whole trip. 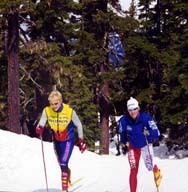 When we graduated from college, Colter and I were essentially equal in terms of ski racing. I decided to keep racing and he decided to devote himself more to adventures like this one. While I am very happy with my decision, their presentation made me want to drop everthing and head for some far-off land and explore. Maybe when I retire from skiing I can do that stuff. Of course, there are always the issues of time and money. If, in the near future, the website updates stop its because I jumped a plane to Tibet. Last day of skiing. We were late getting up to the trail today because we had to pack and check out of the condo. We are leaving for Park City directly from skiing. It was very slow skiing by the time we got there at 9:30. We did some skate and classic video to ananlyze later. We had done this filming on Tueday, but when we went to watch it on Friday, the entire tape was just soap operas. The VCR in the condo must have been preprogrammed to record at a certain time and it erased the previous workout. The first question we asked was, "why hadn't it been taken out of the machine earlier." The second question we asked was, "who was watching soap operas?" Anyway, we fimed for 20 minutes or so, then skied for an hour. After skiing, it was time to hit the road. We knew it would not be a pleasant drive because it is about 11 hours from Bend to Park City, plus it was 90 degrees today and my air conditioner is broken. Yeehaw. Made it back to Park City today. We stopped in Twin Falls, ID for the night because we jsut couldn't take it anymore. We had the windows rolled down all the way for 7 hours straight and the temperature in the truck was still above 90 the whole time. At least its a dry heat. Today was slightly better, but we were very happy to be home and to take a few days off, both from training and driving. You would think that after a week of skiing in June I would have had enough. But I am an addict and I need my fix, so if I can find snow, I will go. Today I drove up to Bald Mountain Pass in the Uinta Mountains east of Park City. The top of the pass is about 11,000 feet (I think). Rumor had it that there was still about 3-4 feet of snow up there. I had to see for myself. I got up at 6am, and was on the snow by 7:15. I wanted to ski on the crust and I knew if I waited until later, it would be too soft. Unfortunately, the snow never really froze last night and it was extremely dirty and covered with tree branches. It was also starting to become sun-cupped, making for rough glide. I skied for over an hour, but it was not all that great. Then again, who am I to complain. Its mid-June and I am skiing. I didn't get to bed until REALLY late last night. Normally I don't bring my social life into my journal, but when it affects my training I think its relevant. A friend and I went out to a club in Salt Lake last night. I figured that we would hang out for a few hours then go home, no big deal. But, time flies when you are having fun and by the time I crawled into bed, it was 3:00am. Not good when you have to get up at 6:00 to go biking. I had planned to go mountain biking before work. This meant a very rude alarm clock at 6:00. Initially I felt great, I jumped out of bed and started getting dressed. Then after 30 seconds it hit me hard. I stumbled back to bed and laid there for about 10 minutes. Everyone who has ever exercised in the morning knows the mental struggle that goes on to convince yourself to get out of a warm, cozy bed to go abuse your body. This morning my body was already abused, making it even tougher. As I laid there, I looked up at the Bjorn Daehlie poster on my wall and thought, "He would be up and training by now." Then I thought, "But he also would have gone to bed more than 3 hours ago." I mustered all the motivation I could find hiding in my body and rolled out of bed. Once I was riding I was fine. The first 30 minutes were tough, but after that I felt great. I rode all over Park City Ski Area, found a few new trails and still made it to work by 10:00. The past week was a very good one for me, training-wise. I did a number of fairly hard workouts (4x5 minute intervals, double poling up a fairly steep fifteen minute hill, skating w/o poles up the same hill) and felt good during each one. I also have had a fairly hectic weekend, so I was very happy to find that I felt very good duing today's 3 hour run. Rob Whitney, Erik Stange, and I did a fantastic point to point trail that started on the Mormon Pioneer Trail (also the Donner Party trail and Pony Express Trail) and then followed the ridge line that separates Park City from Salt Lake City back to the Moose Hollow area where we do alot of our interval running. It was a perfect day and the wildflowers were in bloom, making it a very scenic run. After the run, though, my week caught up with me. I made it home just in time to collapse for a three hour nap. Ahh, Sundays. If only there was football on TV it would have been perfect. I also want to send out a Happy Birthday to my brother who turns 23 today!